There's something about cranberries that instantly puts me in the festive spirit--does that happen for you, too? This season I've been working with Ocean Spray to share hosting tips and ideas to make your Thanksgiving go as smoothly as possible--especially for those of you hosting for the first time! Earlier this week we talked about a few of my favorite hosting tips, and today I want to share a sweet recipe that will be one of your secret weapons when entertaining your Thanksgiving guests. 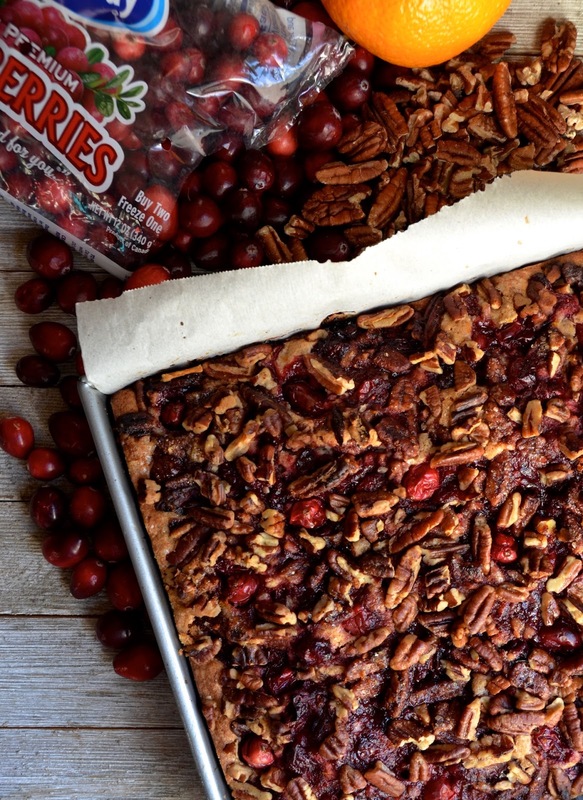 This one features Ocean Spray® Fresh Cranberries, which are my forever fave. I always make a point of buying a few extra bags each time I shop--some to use right away, and some to pop in the freezer to enjoy later! They're such a quick and easy way to add color, flavor, and a little holiday twist to all your favorite recipes. One of the things I love about this season is the way the house fills up with guests--from family and loved ones who join in for the big meal, to the out-of-town friends you get to see during these busy festive days, it's a season filled with sharing. But all that fun can also means a lot of work. The secret to getting through these crazy days is to bookmark a few simple recipes that can do double (or even triple!) duty. Like this gorgeous (and so easy!) 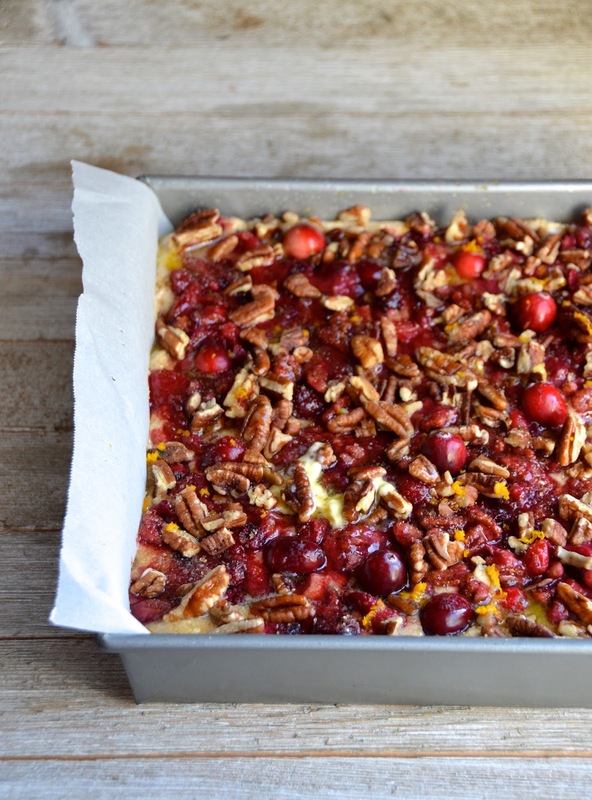 Orange Cranberry Pecan Coffee Cake. It's a simple one-pan cake that will come in handy so many ways this week. 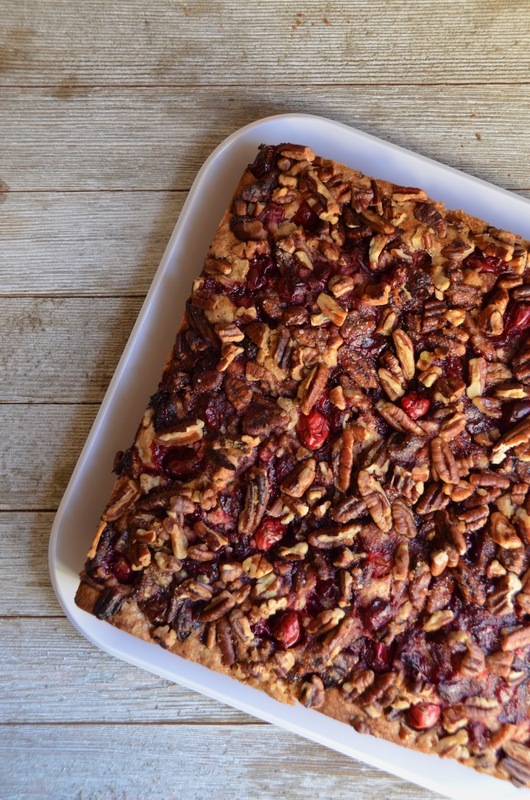 Serve it as a make-ahead brunch or breakfast dish on Thanksgiving morning (or the day after), along with the traditional pies at the end of the big meal, bring it to the office for the Thanksgiving potluck you almost totally forgot about, or even just keep it on hand for snacking on or enjoying with a mug of coffee when you need a little break from the bustle. It keeps really well for several days, so you can make it in advance and have it ready to go when needed. How perfect is that?! Now let's talk about this gorgeous cake! 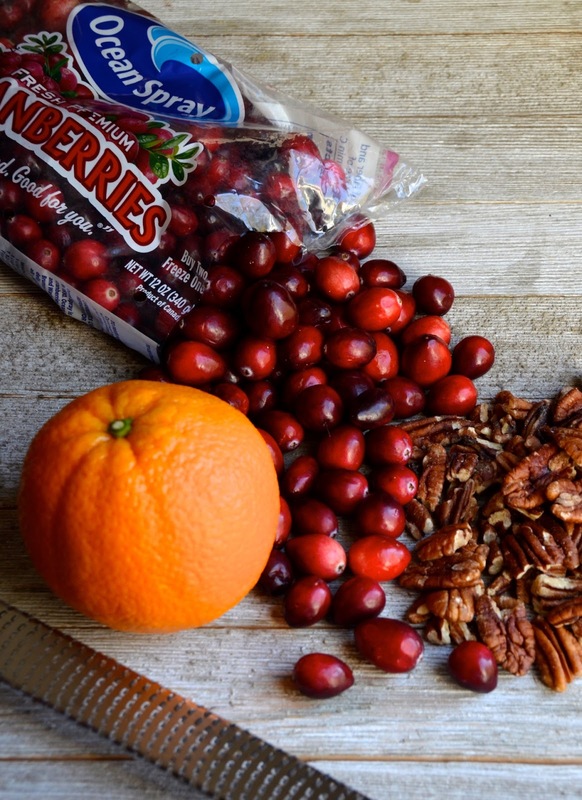 Cranberries and oranges have always been a perfect match (I always add a little fresh orange to my homemade cranberry sauce just to make it extra special), and I also love the way they pair with toasted pecans. 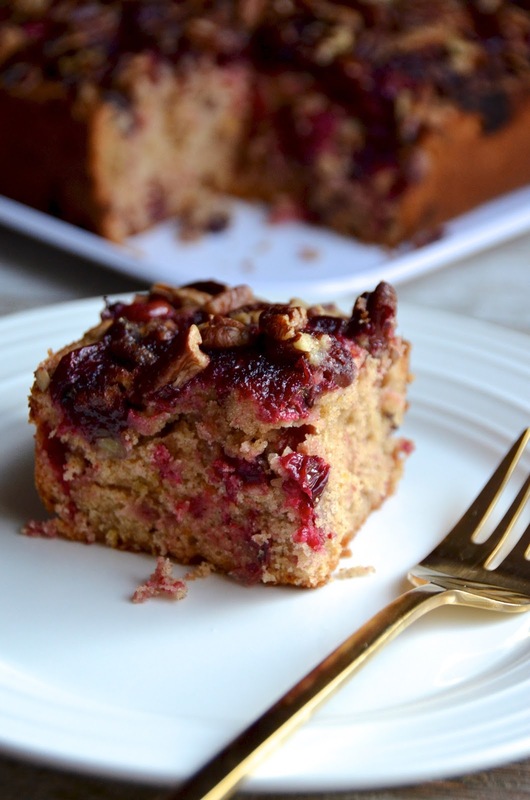 This easy cranberry cake recipe brings all those good flavors together in one. Scroll down for the recipe, and let me know if I can help with any last-minute Thanksgiving questions! You can also use the hashtag #AskCranMa on social media for tips and advice from Ocean Sprays team of expert CranMas (aka cranberry farmer grandmas!). Thank you to Ocean Spray for sponsoring this post. As always, all opinions and recipes are my own! For more recipes and Thanksgiving advice (and to learn where to find these cranberries and other Ocean Spray products), visit OceanSprayThanksgiving.com. Preheat oven to 350 degrees. Grease an 8" square baking tin. In the base of an electric mixer, combine the butter and sugar and beat until fluffy. About 3 minutes. Add the olive oil and eggs and beat 5 minutes until light and yellow colored. Add the vanilla and milk. In a small bowl, whisk together flour, baking powder, cinnamon, orange zest, and salt. Pour into liquid ingredients and mix just until evenly combined. Stir in about 1/2 of the cranberries (just a handful of them). Then pour the mixture into the prepared cake pan and spread evenly. Sprinkle with the raw sugar, then top with the cranberries and pecans, spreading evenly and pressing slightly into the batter. Pour the melted butter over the top and sprinkle with a bit more cinnamon. Bake 45 minutes or until fully cooked through and golden on top. Let cool completely in cake pan before serving.